Artificial intelligence (AI) is one of today’s trending topics across different business sectors. Simply put, AI is a term to describe types of technology that can simulate human intelligence. AI is used to analyze data in a contextual manner to provide requested information, supply interpretation, or trigger an event based on the results. AI is often thought of as merely a tool that can accomplish menial tasks such as paperwork and scheduling. However, AI technology holds a lot of potential, especially in the business world. At present, AI is doing more than just providing companies with virtual personal assistants — it is transforming how marketing works. AI has provided a great help to digital marketers today by supplying a huge amount of information that is accessible from advanced data analytics tools, providing more insight on consumers and how to market directly to them. Japan’s AI market is currently on the rise. According to a study conducted by a Japanese think-tank, the Ernst & Young Institute, the size of Japan’s AI market is estimated to grow from approximately JPY 3.7 trillion in 2015 to JPY 23 trillion in 2020, a six-fold increase. Consequently, the market size will reach about JPY 87 trillion by 2030. Japanese organizations in numerous industries are already using AI technologies in varied business functions. One of these industries is marketing and advertising. In the past, marketers were somewhat hesitant to integrate artificial intelligence (AI) in their digital marketing strategies. This viewpoint has since changed. Currently, they are more confident in employing AI, since its ambiguity in terms of the results it provides has been reduced. At present, marketers are taking advantage of the power of AI to gather valuable insights about their customers, automate tasks, and improve workflows. 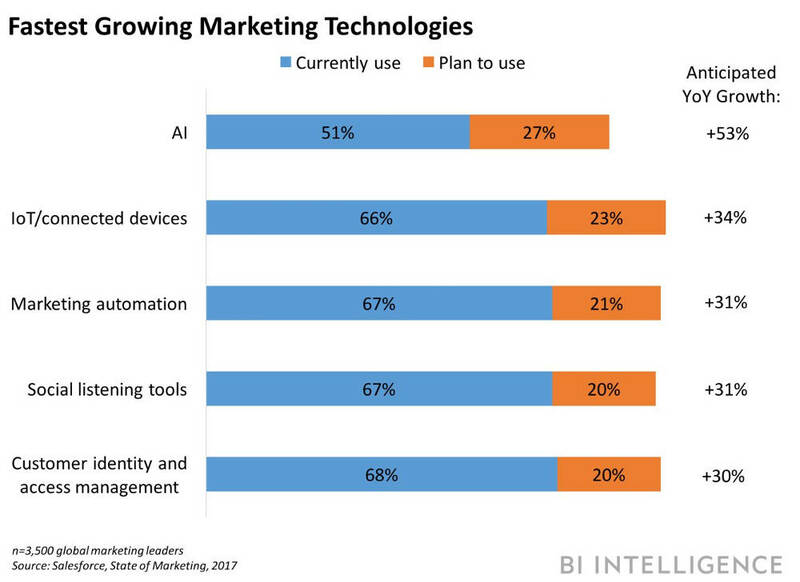 According to Salesforce, over half (51%) of marketers use AI, and an additional 27% are expected to integrate the technology by 2019. This represents the highest estimated year-over-year (YoY) growth of any leading technology that marketers anticipate to implement next year. In addition, as the size of consumer-generated data increases, AI computing techniques — like machine learning, deep learning, and natural language processing (NLP) — will become progressively significant to data-driven decision-making. Furthermore, in a survey conducted to over 1,600 professionals dedicated to marketing, 61% of the respondents, without considering the size of their company, mentioned that both artificial intelligence and machine learning will be the most important data initiatives in 2019. Programmatic advertising is the purchase of digital display space using software and algorithms. This process uses artificial intelligence to tailor a specific message for a target audience by using audience data and insights from different sources to show highly relevant ads at the right time and in the right place. AI technologies have algorithms that interpret a visitor’s behavior enabling real-time campaign optimizations toward an audience more likely to convert. Programmatic advertising ranges across various platforms, such that any format and any channel can be accessed programmatically, including mobile, desktop, table, audio, digital outdoor and connected television. 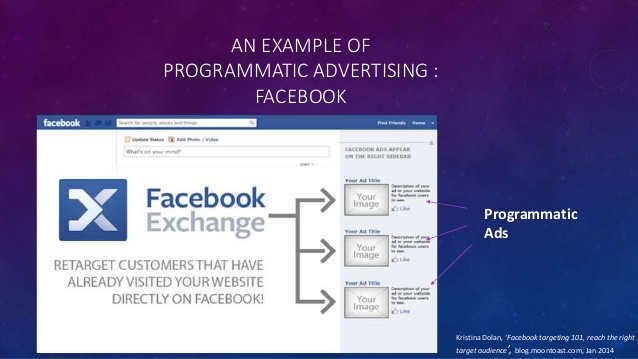 An example of programmatic advertising can be seen in Facebook and Google’s ad platforms. These use machine learning and artificial intelligence to find people most likely to make the advertiser’s desired action. For this to be achieved, they analyze the user’s information (like their interests, demographics) in order to detect the best audience for their brand. One of the most straight-forward marketing applications of AI in business lies in its ability to make predictions. Predictive analysis is the use of data, statistical algorithms, and machine learning techniques to determine the probability of future conclusions based on historical data. Predictive models can be used in numerous areas, which includes marketing. Using these models, it is possible to predict the probability of a specific prospect becoming a client. Predictions on other aspects can also be made, such as the quoted price necessary to make a conversion, or which customers are more prone to making more than one purchase. One example of how this technology is incorporated in digital marketing is the ranking of prospects and lead scoring. Predictive models produced by machine learning can be trained to rank prospects or leads according to certain criteria that the sales team defines as “qualified purchasers.” In doing this, the sales team won’t waste any more time on leads that will never convert and can concentrate on those that will. This saves substantial time and resources as well as contributes to increasing sales. 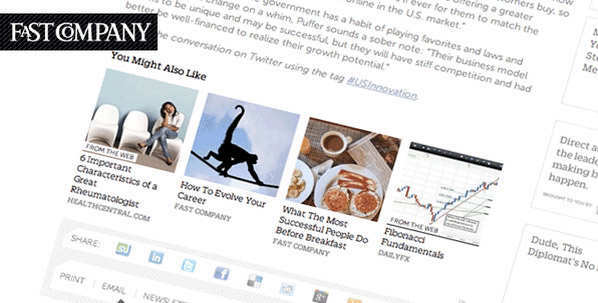 It’s familiar to see the “If you liked this, you might also like…” content recommendations at the end of many articles on the internet. These recommendations are actually based on deep learning and other AI, where machines analyze data about people’s behavior on the web to determine what they’re most likely to want to do next. Today’s refined online recommendations aren’t merely based on a simple human-determined set of guidelines or even a simple set of historical ratings from other users. Instead, a recommendation engine is used where it analyzes a significant amount of meaningful data in order to draw conclusions from behaviors, actions, etc. Aside from utilizing AI to make content recommendations, marketers are also able to leverage deep learning to make product recommendations. Several eCommerce websites demonstrate how AI is used to recommend products based on the products a customer clicks and buys. 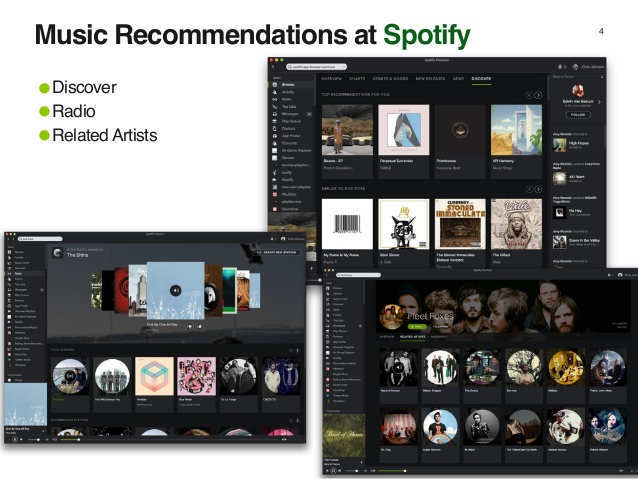 Other examples include Amazon’s book or product recommendations, and how Spotify knows a customer’s taste in music so well. In the past, if a client “searches” an online store to find a product, finding the result that they had in mind would be highly unlikely unless they knew its name or exact title. At present, search engines are much smarter, and its improved capacity is not limited to finding the right information on Google, but also finding the right products on Amazon, the right movies on Netflix, among others. There have been two great developments in AI that transformed internet searches and search engine optimization (SEO): voice search and Google’s algorithm, RankBrain. In addition, innovations like Amazon Echo, Google Home, Apple’s Siri, and Microsoft’s Cortana make it easier and more convenient for people to perform searches by just pressing a button or saying a voice command. Since the way users perform online searches have changed, this has now affected the way in which marketers create and optimize their web content. As marketing channels multiply, it is necessary for marketers to find a cost-effective way to manage interactions. Several companies use chatbots — AI technologies that are able to interact with humans — to reply to common questions, assist with purchases, book travel, to name a few. A chatbot powered by AI can be distinguished by its ability to answer open-ended questions. In order to find the correct response, these bots utilize natural learning processing and machine learning. In addition, the use of chatbots also has many other unique benefits. They can attend to clients 24/7 and retain their data. They’re also friendly and never lose their patience. Chatbots can answer numerous requests from different customers simultaneously, so wait time will no longer be a problem. For example, Sephora is a company that uses a chatbot to suggest beauty tips to its users, as well as offers them the best cosmetic products according to their needs. In addition, Sephora Virtual Artist lets potential clients “test” cosmetic products like lipsticks, eyeshadows and highlighting palettes through its application or website. Virtual Artist has the ability to recognize facial features then use augmented reality to apply the selected product to the user’s photo. These applications of AI are just a few among many. Because of continuous innovations and developments in technology, the possibilities are endless. There are still hundreds of potential applications of AI in marketing and advertising. At present, many Japanese companies have been relatively slow in taking advantage of opportunities presented by AI. However, it has started to gain attention beyond research institutes and corporations already active in this field. There is a major shift anticipated in the perception of AI technology, where it will become more accepted by people. In marketing, AI applications provided by Japanese companies are in data analysis, automated marketing, and image recognition. This has changed the way business is done. In 2015, a Japanese venture capital firm became the first company in history to nominate an AI as a board member. This particular AI had the ability to predict market trends faster than humans. Recently, McCann Japan, a Japanese company, also created and named the world’s first AI creative director. Named AI-CD β, this artificial intelligence is able to give creative direction for commercials. To develop the AI, the developers deconstructed, analyzed and tagged a wide range of TV commercials, including the winners of the All Japan Radio & Television Commercial Confederation’s annual CM Festival (ACC CM Festival) awards for the past 10 years. The AI is intended to sift through the Festival’s database and creatively direct the ideal commercial for any given product or message. Through this technology, it is now possible to provide clients with work produced through logic-based creative direction based on past TV commercial data. On top of giving creative direction for advertisements, AI-CD β also assesses and learns from results after the commercials have aired, to improve precision for future projects. In summary, AI marketing and advertising has introduced new opportunities for marketers across the world. Developments such as programmatic advertising, marketing forecasting, predictive analysis, recommendation and search engines, and chatbots have made it easier for companies to identify, attract and engage with their target market. These innovations are evolving the world of digital marketing. The AI advertising landscape in Japan is gradually evolving. Japanese companies have started to embrace AI in their marketing and advertising strategies, in recognition of this technology’s advantages and potential. 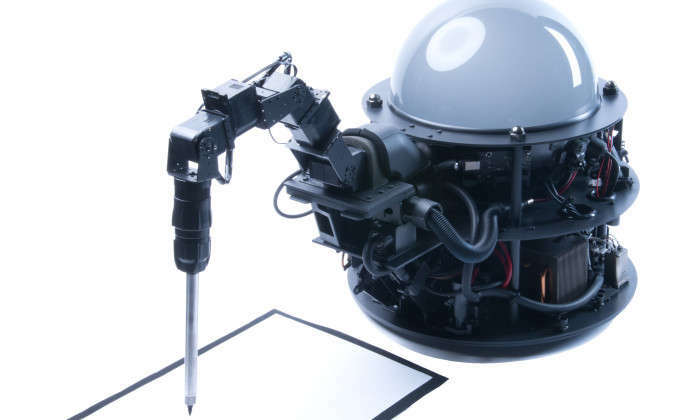 To know more about AI advertising and marketing in Japan, contact us at Info Cubic Japan today.